Frustration Station ~ The Bucky Channel - The World of Sports from Wisconsin's Perspective. 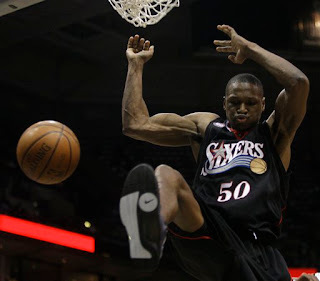 This is a picture of Theo Ratliff. Not only is this guy still in the league but he managed two dunks and two blocks. I say this only because I had no idea he was dusted off and still milling around. The Bucks (17-20) lose a game in which they led late in the 4th to the 76ers (15-20) 110-105. Milwaukee also continues its win, lose, win, lose streak. By the way, Donyell Marshall made an appearance for these 76ers as well. Its like I'm having early 00's deja vu. Might as well have seen an unknown Raja Bell lighting us up in game 7, or Vegas "Finals Odds" ruining game 5 or Lindsey Hunter's ghost floating about, sabotaging Milwaukee.......ah I thought I blocked that out of my brain. With the fix, everyone knows the NBA wanted Iverson and the 76ers in the finals that year. Vegas, Stern, refs, the guy selling popcorn at the arena in Philly..... I blame everyone. The Bucks managed to lead at half and at the end of three, but slipped up towards the fourth period. This was a game the Bucks really had to win, especially if they want to be known as a good team in the East. Michael Redd scored 20 points tonight while also dishing out 7 assists. Richard Jefferson led with a team high 27 points. Andrew Bogut was sorely missed tonight. The team is 1-5 without him this season. CV was big off the bench again scoring 26 while grabbing 7 boards and dropping 4 dimes. What a way to lose. The unfathomable shot by a man who is only a 28% 3 point shooter. I mean Andre Miller is a good player, good guy, but come on. COME ON. He had no reason to even take that shot, the situation and his history were totally against him. *sigh* Tough one to swallow. The Sixers made 14 more points from the free-throw line. That was an old problem I thought the Bucks had remedied some, it is amazing how old habits trickle back when you have injury issues to your better players. I'm about as P.O.ed about this loss as any this year. I cannot even take comfort in this Box Score. I'm so riled up. Why did I even post the Box score of game 5 from 2001 in the first paragraph. For the record, do I really think the fix was in? I honestly do not know what to believe, but I am still bitter about that series. Eight years later and I'm still mad about it. Milwaukee gets the (18-18) New Jersey Nets at home Friday night at 7:30 pm. TBC's Buck of the Game: Charlie Villanueva - He may or may not be on his way out, but he is contributing big of the bench this season.